Desk Secrets: Have You Ever Wanted To Be A Spy? Raise your hand if you're a spy. Ahh, I see you didn't raise your hand. Exactly what a real spy would do. Your identity has been compromised. It seems you need to hone your skills. 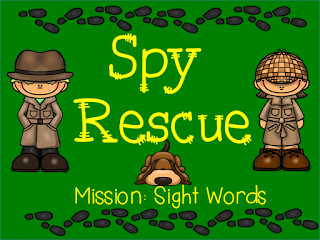 I have just the game for you and your students -- Spy Rescue . It's a sight word spy game for 2 to 4 players that can be played competitively or cooperatively. You will have to utilize all your spy skills to quickly gain access to the top secret plans before another spy beats you to it. Be about your business quickly agent K3. We are all counting on you.